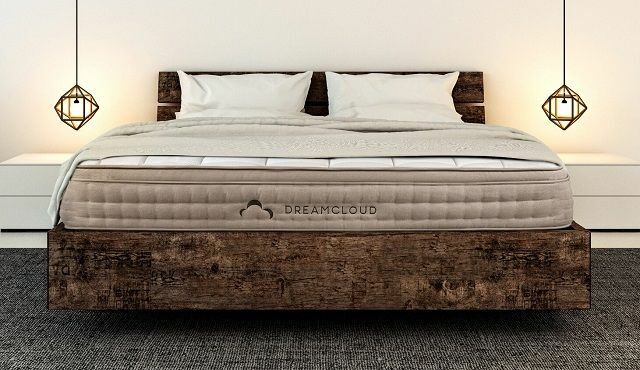 DreamCloud is a 15” luxury hybrid mattress combining the best of latex, memory foam, hand crafted Cashmere, tufting and coil technology to provide the best sleep money can buy. The finest destination for exceptional sleep, there truly is no place like DreamCloud. DreamCloud is designed for every type of sleeper and arrives backed by their Full Comfort Guarantee and Everlong Warranty, plus a full year sleep trial so you can make sure DreamCloud is right for you, at no risk. DreamCloud arrives straight to your door and you’ll discover there is no place designed to lovingly cradle every inch of the human body and seduce it into sleep. Dreamcloud floats at the intersection of sumptuous and luscious. And if you don’t agree, they will take DreamCloud mattress back and refund your full purchase. Take $200 Off Your Dream Cloud Mattress, 365-Night Free Trial and Free Nationwide Shipping at dreamcloudsleep.com. Feel the DreamCloud Difference Today. DreamCloud Sleep is a hybrid mattress, which combines the supportive nature of a box spring mattress with high density memory foams that offer superior support. A hybrid mattress is a popular choice for a mattress for many sleepers, since it provides “best of all worlds” experience. Hybrid mattresses provides a great balance of superior support of coils and the contouring comfort of the premium foam. In addition, the hand tufted Cashmere cover, heat-treated cotton pads, and high density foams are designed to keep mattress cool. the mattress also features a patent-pending encased coils designed to provide great support during your sleep. Dream Cloud Sleep mattress is designed with 15 inches of meticulously crafted with 8 unique layers of premium latex and foam materials. It combines the best of memory foam, latex, tufting and coil technology to provide a superior sleep experience. DreamCloud is designed with a high density foundation foam base layer that helps reduce any motion transfer and ensures that movements and motions are absorbed. Its hand-tufted cashmere blend topper is the most sought-after fabric in the market designed to provide maximum breathability and softness for a luxury sleep experience. Cashmere is one of the most luxurious material due to its unmatched softness, expensive production costs, and limited availability. Cashmere is produced with wool that is sheared from the soft undercoat of goats bred. These goats are scarce and come only from select regions. Per year only 6,500 metric tons of pure Cashmere are produced compared to 2 million metric tons of sheep’s wool. Producing Cashmere is a very labor-intensive and expensive process, involving manual sorting and combing each hair. Due to an expensive cost of manufacturing of Cashmere, most mattress companies don't use a Cashmere blend to design their covers. But with DreamCloud's True Tufted™ Cashmere Polyester Blend Cover, you will get a premium feel of a top quality luxury mattress on the market. Cashmere is much more cooling than conventional foam or cotton and is known to give a cool sleep. DreamCloud Cashmere blend cover is hand-tufted and does not use adhesives to compress or blend the materials together. The DreamCloud sleep mattress also features Gel-infused memory foam that helps with heat distribution and support that provides great spinal alignment to your body. 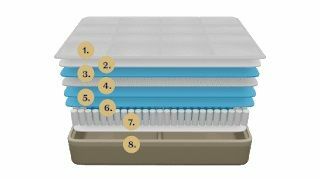 DreamCloud mattress also comes with patented BestRest Coils organized into 5 unique comfort zones to provide the precise level of support at much needed areas with pressure points. DreamCloud’s hypoallergenic, premium natural latex offers a responsive bounce with deep contouring support that adjusts to your sleeping style and position throughout the night. True Tufted™ Cashmere Polyester Blend Cover: DreamCloud’s Cashmere polyester blend cover offers superior breathability and softness to the mattress. Gel Infused Memory Foam: DreamCloud’s gel infused foam provide cooling and supporting experience with contouring support that conforms based on your sleeping position. Super Soft Quilted Memory Foam: This quilted foam provides a super soft cushion for a luxury sleeping experience. Supreme Natural Latex: This layer of DreamCloud mattress comes with a hypoallergenic super premium natural latex layer that offers a great bounce for added contouring. Dream Plush Supporting Memory Foam: The layer of high density memory foam provides deep contouring support that suits multiple sleeping positions. Super Dense Super Soft Memory Foam: The super dense foam is designed provide a strong support in the mattress regardless of what sleep position you prefer. Patent-Pending “Bestrest” Coils: This is a five-zoned foam micro coil compression system designed to provide a great support. High Density Super Soft Memory Foam: And as a final base layer, DreamCloud’s High density foundation foam ensures that your your body supported and helps reduce motion transfer for a superior sleeping experience. DreamCloud unique foam layers are designed with innovative system of quilted memory foams, foundational foams and super soft foams to provide the correct balance of softness, structure and support. DreamCloud uses high-end foams which are 3x the price that the foams found in other mattresses in the market. The foams are wrapped around the BestRest coil system to give you a superior support. DreamCloud sleeps cool due to breathable foams, unlike the foams used in typical mattresses. All Dream Cloud mattresses are backed by their Full Comfort Guarantee and Everlong Warranty and a full year sleep trial so you can make a risk-free decision to choose DreamCloud. With your mattress purchase comes with 365 nights risk-free sleep trial to help you decide if DreamCloud mattress is a right choice for you. For any reason if you feel that DreamCloud is not your ideal mattress, reach out to DreamCloud support team and they will arrange a pick-up of the mattress from your home and refund your payment. Most of the other mattresses in the industry come with 100 night trial, so with DreamCloud you get 3 times longer sleep trial than any other mattress. Most of the customers like their DreamCloud mattress and end up keeping it, as evident in DreamCloud's less than 3% return rate. You qualify for the sleep trial even if you have financed your mattress. Dreamcloud mattress is backed by their Forever Warranty which covers the materials, construction, durability and quality of DreamCloud. With DreamCloud, you will enjoy a premium luxury mattress using superior foams at a much better price. If you decide to return your DreamCloud mattress then reach out th DreamCloud Sleep team and their Concierge team will work with you to arrange a pickup and refund your payment once your mattress is picked up. It typically takes about 2 to 3 business days to get refunds deposited to your account. 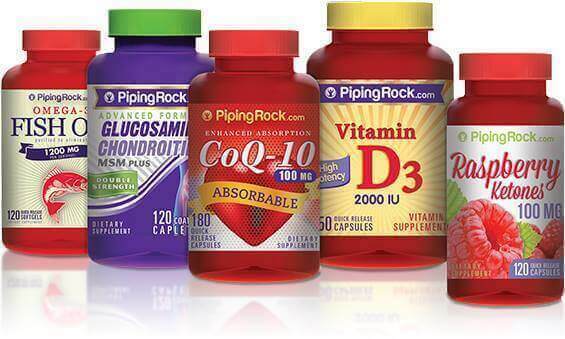 A good sleep foundation can help eliminate back pain and other problematic health issues. However, not all sleep foundations are the same. Some have rollups, others have a more complicated setup. But for the most part you still end up with pain and discomfort after sleeping. Which is why the Dreamcloud Foundation does change some things, for the better. This foundation designed to help eliminate all these problems and at the same time it’s also very adaptable and reliable too. DreamCloud foundation uses naturally sourced wood. It doesn’t use a lot of plastic like other cheap foundations do. It offers that sense of quality and reliability. Despite being very durable, the upper side of the Dreamcloud Foundation does have textiles and you can rip it off if you’re not careful. That means you do need to pay attention while using and handling it. You would always want your foundation to be very reliable, durable and easy to assemble. The Dreamcloud Foundation exceeds in all of those aspects. Assembling is quick and easy. You do need to follow the instructions, but the reality is that this entire process is very intuitive. You can figure out what you have to do even without any instructions. Also, there’s no need for special tools. A lot of sleep foundations have special tools that you have to use for the assembly process. There’s nothing wrong with that, however, the sheer fact that you must use something like that and you don’t obtain a simpler assembly method can be a bit problematic. The ease of installation is what really makes DreamCloud sleep amazing. One of the best things about the Dreamcloud Foundation is that it definitely delivers the quality and value you need and in the end it will be well worth the effort. There are multiple sizes to choose from, anywhere from Twin to King. The trick here is to figure out the foundation and mattress size beforehand. Ideally you want to get both from DreamCloud, but even if you don’t you should have a good idea of what bed size you need. Based on that you can go shopping right away. Pricing for the smaller sizes starts at $200, whereas the largest will cost you $270+. Is DreamCloud A Good Replacement For Your Old Foundation? DreamCloud offers 100 nights on all foundations. Even if it takes more than 3 months, it’s important to note that the company does allow you to refund the unit if you dislike it. They have quite a lot of confidence in the product, and that definitely shows here. As explained in this DreamCloud Foundation review, we really liked this foundation which offered a really good night’s sleep. There were no issues like back pain or discomfort. Instead, we slept very well every time when used DreamCloud. Speaking of the foundation itself, it’s very durable and it’s designed to withstand a lot of pressure and weight. Even if both you and your partner are overweight, this foundation will not have any issues supporting the weight. It certainly delivers the value and quality you want, so try to use that to your own advantage. The unit on its own certainly looks and feels luxurious. And for the most part it offers that great, premium feel. It’s quite durable, but the textile part can scratch and that’s obviously something that you really want to avoid if possible. However, if you use it right and stay away from damaging it too much, this product has the potential to last for a very, very long time. Is DreamCloud Foundation Worth Your Money? In our DreamCloud Foundation review, we can say that this product is great for anyone who is looking for a quality and long lasting foundation. You can use a Dreamcloud Foundation promo code to save on your DreamCloud foundation purchase and be confident about the value it will deliver to you. While it does take a bit of getting used to, it works quite nicely and you can easily adapt and adjust this to your own needs. This foundation offers a good night’s sleep and you will always be quite amazed with how great you feel, all thanks to this amazing product. It’s reliable, durable and at the same time it’s more than dependable. While it might take a little bit to get used to it, this is the type of product you will enjoy a lot and you will have a great time using it. Also, the purchase process is very quick. The DreamCloud online store is convenient, and you can easily use the DreamCloud Foundation promo code to save on your purchase. In the end, the DreamCloud Foundation is maybe one of the best premium foundations out there, and it’s also made from natural materials, so it has that sense of quality and authenticity that others foundations lack!